Sewing master Kim In-ja and her workshop look alike. Hidden on the hillside of the Bukchon Hanok Village, visitors must walk following narrow stone stairs and small flower planted rock gardens to reach the workshop that overlooks the traditional houses of the village. Although Dangchomun Kim In-ja Hanbok is not as fancy as boutiques in big cities, her small shop and Kim herself, the sewing master and the holder of Korean Important Intangible Cultural Properties No.89., exudes the simple and natural beauty of wildflowers on the street that look weak but are strong enough to rise time and again. Even with many internationally acclaimed fashion designers, including Giorgio Armani and Miuccia Prada, saying they get inspirations from hanbok, and K-pop artists like BTS and Lee Hyo-ri have shown the beauty of it, Kim says life as a "chimseonjang" or sewing master is not easy. 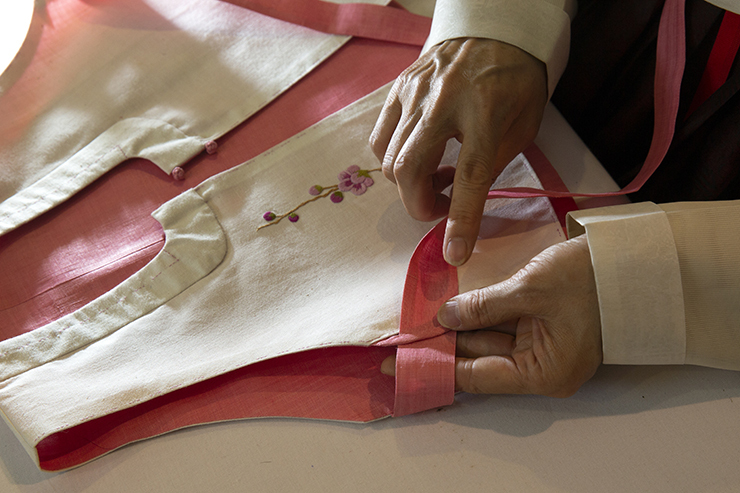 "I, like many other hanbok designers, started sewing to make a living. Thanks to BTS and K-pop's rise, I started to see many people, including foreigners, showing interest in learning about hanbok making, particularly over the recent couple of years. But, nonetheless the industry overall is in decline," said Kim is an interview with The Korea Times at her workshop in central Seoul, Monday. As more young Koreans say no to marriage and the wedding ceremony gets streamlined, less and less people purchase the customer-made traditional attire that people used to customarily wear on their weddings. "Still many people think hanbok are only for special occasions. Dramas continuously depict women from wealthy families wearing hanbok, symbolizing it as symbol of luxury, while delivering some covert message that it is uncomfortable to wear as a daily garment," said the needlework master. Born in 1955 in Seoul, Kim began learning how to sew in the 1980s from the late master Jung Jeong-wan, who became the first master in needlework in 1988. Since she held her first exhibition in Paris in 1998, displaying some 60 hanbok, she has been exhibiting her works and giving seminars in many countries aiming to bring the Korean silhouette to overseas audiences. One of her most striking works includes the collaborative installation that displayed a few hanbok in a layered way at an exhibition titled "Constancy and Change in Korean Traditional Crafts 2013" at the Milan International Furniture Fair in Italy. The sensational work showed the world the possibility of creating a modern work of art from traditional Korean attire, and that Korean craftwork can be developed as a new, hybrid form of cultural representation. "The Milan exhibition was like a turning point for me. Having seen my works traveling to many countries and displayed there, I reflected on my life as a sewing master. Facing a sharp decrease in demand for traditional attire, I had hard moments and saw many fellow hanbok designers shut down their businesses over the past 30 years. For me, showing my works at global exhibitions was like a reward for a lifetime of honing myself to this sole craftsmanship," she said. Kim In-ja shows her hand-stitched work in her workshop in Seoul, Monday. / Korea Times photo by Choi Won-suk. Hanbok exude different charms depending on the fabric they are made of or color. Unlike western clothing, hanbok are made with flat fabric in a linear shape that only achieves dimensionality when it is worn. Then it reveals its own natural, elegant and flowing beauty. K-pop sensation BTS wore robe-like hanbok with modern touches and sneakers in their latest music video, prompting a widespread fad with some younger people visiting palaces in hanbok to take photos. But many, mindful of preserving the beauty of hanbok, raised concerns that the cheap and overly modified hanbok rented out to tourists hamper its authenticity. "I thought BTS' hanbok was really cool. Although I'm someone who works hard to preserve the beauty of the Korean traditional attire, basically I disagree that only certain forms of hanbok keeping the 17th century design should be called authentic hanbok and those modified ones not," said Kim in an ivory white "jeogori" or jacket and a violet "chima" or skirt. She says having happy memories wearing hanbok is more important. "Those young people who took photos wearing rented hanbok will recall the happy moments when they look at the photos later. Once they get older, those hanbok fans will not stay with cheap and modified versions and may want to try more authentic and traditional hanbok," said the artisan. Currently she has been putting a lot of effort into finding previously unknown designs of the 17th century that can be made to look modern to people of today. "Many of my recent designs are borrowed from the 17th century. With just a little modification, for instance in the length of the collar, adding some ornament or changing into preferred pastel colors, they can make wonderful daily clothes that can go perfectly with jeans," said Kim. "For the rest of my life, I want to introduce more of such great hanbok designs from the past, because one should first learn the past in order to take steps and go forward to the future. I feel it is my calling to hand down my skills to the next generation so more people can appreciate its traditional values and beauty." Kim will hold a hanbok fashion show displaying 80 hand-stitched works during the Jongno Hanbok Festival that kicks off in Seoul, Friday. 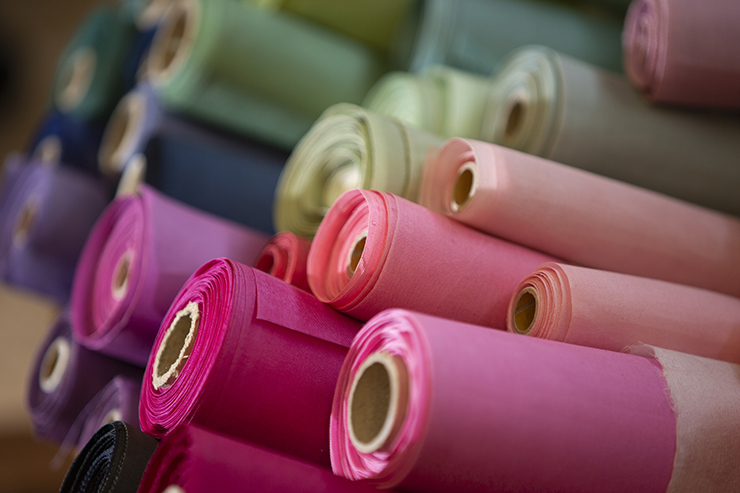 Stacks of colorful fabric rolls used for making traditional Korean garments / Korea Times photo by Choi Won-suk.